On Sunday he tweeted: "#Jesus endured sufferings to oppose tyrants who had put humans in hell in this world& the hereafter while he backed the oppressed. #Ferguson"
Who is Iran's supreme leader? 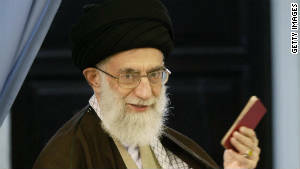 Ayatollah Ali Khamenei, the country's chief political and religious authority, acknowledged the role of Jesus in Islamic theology and compared the biblical prophet's struggle to that of black people in the United States. It read: "It's expected that followers of #Jesus follow him in his fight against arrogants and in his support for the oppressed. #BlackLivesMatter"
The tweet said: "#Jesus like all prophets was herald of monotheism& human dignity; nowadays humanity needs this message more than ever.#Ferguson #Gaza 1/1/93"
The unverified Twitter account, widely accepted as the mouthpiece of the Ayatollah's social media campaign, often posts diatribes against the West and Israel to its more than 91,000 followers. In August of this year, the leader published a poignant image that criticized President Barack Obama's support for Israel during the country's military operation to debilitate Hamas, a group many Western nations including the U.S. designate as a terrorist organization. "US govt has subjugated a great nation w/ massive resources to a criminal regime like #Israel.10/31/12 #Ferguson #Gaza," it said. In its 2013 report on Iran, Human Rights Watch said: "Many civil society activists remained in prison on political charges. Authorities regularly subjected prisoners, especially those convicted on politically motivated charges, to abuse and deprive them of necessary medical treatment. "Iranian women continued to face discrimination in many areas including personal status matters. Authorities restricted political participation and employment of minority groups, who account for about 10% of the population."